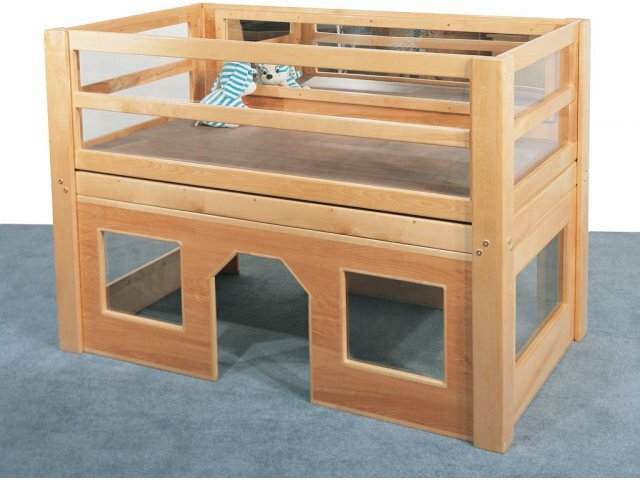 The Deluxe StimuCenter Infant Loft from Strictly for Kids features a two-tier design that makes it ideal for multi-stage daycare centers and nursery schools. The upper tier provides a safe place for newborns-5 month olds, and includes a durable, 2-inch thick vinyl mat and acrylic mirror for early stimulation. The bottom tier forms a crawl-way maze that encourages crawling babies to explore and develop early social skills. 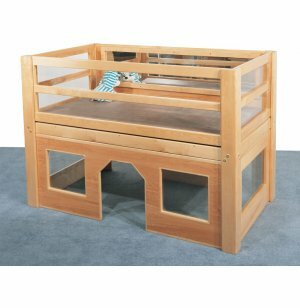 Constructed from beautiful, super-durable solid maple with unbreakable Lexan windows that keep little ones in constant view of caregivers. For ages newborn-23 months. Exceptional Durability: Beautiful solid maple construction is unusually strong and highly durable. Multi-Stage: Two-tier design makes the StimuCenter appropriate for ages newborn-23 months. Facilitates Social Interaction: Encourages crawling babies and toddlers to interact and practice social skills.